Are you the leader of the pack? Well, in Wolf Gold you certainly could be. Battle it out with this cunning canine to hit the big time and take a bite out of the massive jackpot prize. The innovative developers at Pragmatic Play have carefully crafted this game and packed it full of exciting features that will definitely have you howling at the moon. So why not try Wolf Gold today and see if you can come out of the desert unscathed and just that little bit richer. Featuring an animal theme, this 5x3 reel slot sensation has a total of 25 winning paylines and is set in a warm desert approaching dusk. The sand and rock formations are a deep orange and yellow and are beautifully contrasted by the striking pink and purple of the evening sky. This is the perfect backdrop for the reels to be set on and you are going to see some desert-dwelling creatures popping up; the soaring eagle, the wild horse, the cunning wolf, the stealthy wildcat and the horned buffalo. You will also notice some lower-value symbols as well and these are represented by the playing card values J, Q, K and A. The aim of the game is to try and land as many winning combinations as you can and information about these formations including the multipliers can be found at the bottom of the screen in the paytable. The wolf is the games Wild and the scatter symbol is designated by the towering rock face and these will become important for unlocking the bonus features so keep an eye out for them. Accompanying the game is a mysterious soundtrack that complements the graphics and gameplay well but if to prefer to focus on forming those winning paylines then you can turn this off from the sound effect menu. This game is great for both slot novices and experienced pros. Bets start from just £0.25 so if you are looking to build up your gaming confidence or are working to a budget, then this game will suit you. High-rollers can still be reassured of a good time with a maximum stake of £125 and a thrilling turbo spin that will increase the pace significantly. You can control the value of your bet using the + and – buttons and once you are happy with your stake you simply hit the spin button to get those symbols spinning. 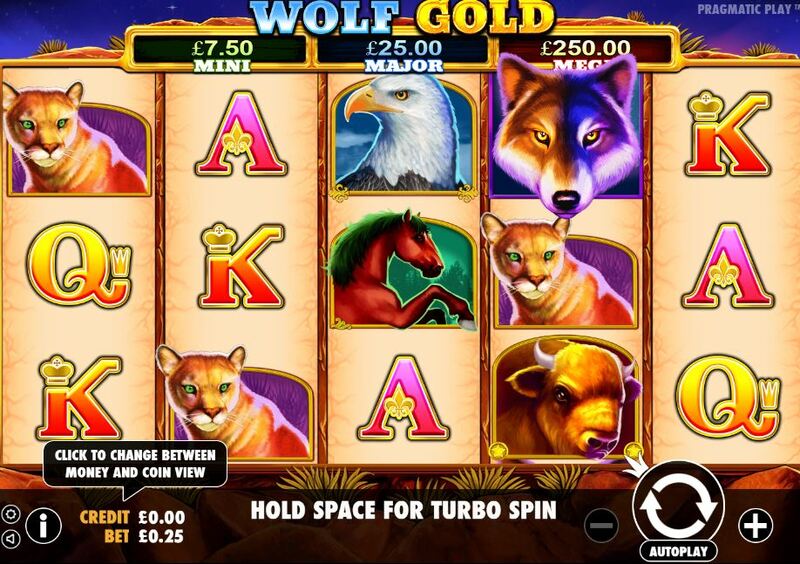 Wolf Gold has two special features which will help to boost your balance and make the game just that little bit more exciting. Money Re-spin is kicked off when you land six of the ‘Moon 6000’ symbols on the reels. As soon as this happens all of the other icons will disappear giving you the opportunity to spin again and try and get higher value symbols to form winning combinations with. The Free Spins round is triggered by three or more of the scatter symbols and these will only land on the first, third and fifth reels. When this occurs you will be given 5 free spins instantly and the reels will change to allow for larger symbols to be included. This will ultimately lead to more free spins and more wins.